There are some languages for which fluency requires more than studying vocabulary and grammar. This is the lesson I continue to learn in my work with Carolyn Kastner, Curator of the Georgia O’Keeffe Museum. The language I am referring to is that of abstraction, particularly of the unique variety of abstraction employed by Georgia O’Keeffe and her American contemporaries. After meeting with Carolyn several times to discuss the subject, I have learned, through her explanations of her research, exhibitions, and publications that deal with O’Keeffe’s life and work, that I am far from proficient in the language of visual abstraction. I have struggled to grasp the beginnings of a full understanding of O’Keeffe’s visual language, but the struggle has been fascinating. I have found that every new insight that improves my comprehension of O’Keeffe’s work has allowed me to view her paintings in a totally new light each time I walk through the Museum’s galleries. 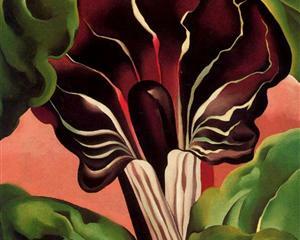 The most striking and exemplary of these realizations came after a presentation Carolyn recently delivered to the Museum staff, in which the evolution of O’Keeffe’s Jack in the Pulpit series was discussed. The comparison I found to be the most significant was made between Numbers Two and Four of the series. As we discussed the visual elements of the paintings, the point of comparison that drew my attention was O’Keeffe’s use of apparently varying degrees of abstraction on different areas of the paintings. I personally observe Jack in the Pulpit No. 2 as appearing more realistic in the foreground, with the rounded, center portion of the flower, as well as the group of petals surrounding it, appearing as three dimensional and solid. Contrarily, the leaves behind the flower are rendered in a more two-dimensional manner, lending them a flatter and less weighty appearance. In Jack in the Pulpit No. 4, it appears that the composition is switched, with the flower appearing as a two-dimensional shape while the leaves behind it are given more physical prominence and three-dimensionality. I wondered if this change in composition was a conscious choice by O’Keeffe and what the significance behind it might be. The discussion had progressed beyond the examination of these particular works by that point, but I made a note to raise the question to Carolyn after the presentation. Fortunately, I was able to discuss my question with Carolyn following the presentation, and her response reinforced the fundamental meaning of abstraction that I often lose sight of. She explained that neither painting is meant to be interpreted for a particular meaning or “significance.” Instead, the paintings are meant to be experienced. Though these abstractions are based on the appearance of the Arisaema triphyllum flower, and their titles are derived from its common name, the paintings are not meant to be representative of the flower. They are aesthetic works, composed of line, color, and shadow, that are, above all, meant to be optically compelling to the viewer. Carolyn reinforced the advice given to me by her and many of my other mentors in her explanation, and the ultimate lesson that can be taken away from this post is that this advice should be taken into consideration by all scholars, art historians, students, and especially museum visitors, particularly those who deal with abstract art. This advice is to never forget to take the time to look at the piece of art you are observing. Yes, labels and resources that provide information like dates and historical context are essential to forming a complete understanding of a work, but so is establishing a visual sense of intimacy with the work in question. This is especially true for the work of abstractionists like Georgia O’Keeffe, whose works are created not to convey an image with a concrete meaning or form, but to provide an aesthetic experience for the viewer. It is advice that I often forget to follow, but it should be considered by every consumer of art, as it can allow even experienced viewers to perceive works of art in wholly new ways. Images Jack in the Pulpit No. 2 and Jack in the Pulpit No. 4 copyright The National Gallery of Art.